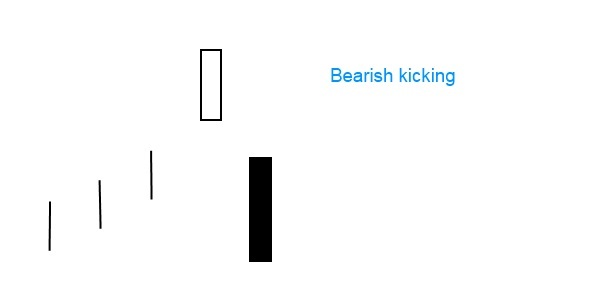 Bearish kicking is a two-candle reversal pattern. There are some criteria to identify this candlestick pattern. The first formation is a white candlestick, a marubozu. It is followed by a black candlestick, a black marubozu, which opens gapping lower than the previous day’s low. The decline continues, finally closing at the low of the day. It’s important that the stock price during the formation of the second candlestick must never rise into the gap. The longer the candlesticks are, the more dramatic the reversal is. The larger the gap is, the more remarkable the reversal is. You may also come accross the opposite formation, the bullish kicking candlestick pattern.